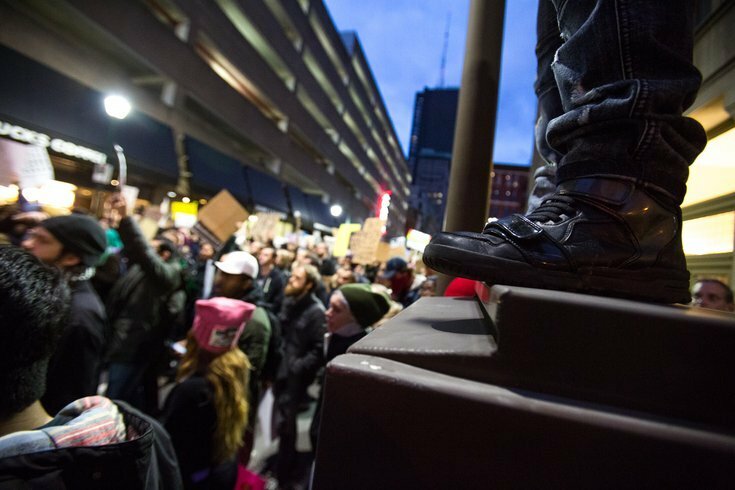 People took to the streets in Philadelphia to protest the visit of President Donald Trump and Vice President Mike Pence, Thursday, Jan. 26, 2017. A protest organized by Refuse Fascism, a national group against President Donald Trump and his administration, is planned in Philadelphia on Saturday, joining sister marches like it across the United States. "The Trump/Pence Regime Must Go! Nationwide Protest" is scheduled to take place from 4 p.m. until 8 p.m. on Saturday and will begin at Thomas Paine Plaza, according to its Facebook event page. "The Trump/Pence Regime daily escalates its fascist attacks on immigrants and Muslims, on health care, on the disabled, and the poor, on Black and Brown people, on women and LGBTQ folks, on the media, on the environment, on the right to protest, on the truth," the event page reads. "We must say NO! Not just for ourselves, but in the name of humanity. Never underestimate the power of the people rising up together with right on our side." Apart from Refuse Fascism, the event is also organized by PA ADAPT, a group that fights for the rights of those with disabilities, the Black Lives Matter Movement Pennsylvania Chapter, Impeachment March Philly and others. Refuse Fascism has called for similar protests across the nation. Events have also been organized in at least 18 cities, including New York, Los Angeles, Chicago, Harrisburg and Seattle. About 150 people are slated to attend the Philly event per the group's Facebook page, with 713 people marked as "interested." An "Impeachment March," as well as a pro-Trump counter march, took place in Philly earlier this month.